This year Brent Council will mark the Mental Health Awareness Week (8 – 14 May) in collaboration with The Nous Organisation. The 2017 theme is ‘Surviving or Thriving’ and we will explore effective strategies and coping techniques that can help us to enjoy a good mental health. There will be an event that will take place in Brent Civic Centre on 13th May 2017 from 11am to 1pm, Board rooms 3, 4 & 5. Brent is celebrating the International Day for Disabled People on 1st December 2016. Marked across the globe, this day has been celebrated by the United Nations since 1992. The event on 1st December 2016 will be held at the Brent Civic Centre from 10am to 3pm and is an opportunity to engage with residents, carers and colleagues. Please contact equality@brent.gov.uk if you wish to register early for this event. Landlords, prospective landlords and property agents are being invited to the Brent and Genesis Landlord Fair which will be held at Brent Civic Centre on Tuesday 19 January 2016 between 5pm-8:30pm. The event will include free seminars and an opportunity to discuss landlord issues with various representatives from Gas Safe, the National Landlords Association and housing benefit and procurement teams. The event is free to attend and light refreshments will be provided. Attendees are asked to complete the registration process by visiting https://brentandgenesis.eventbrite.co.uk or email landlord.event@brent.gov.uk for more information. Penderels Trust, who support independent living for adult social care users is inviting anyone who receives a Direct Payment or is thinking of switching to the scheme to join them at Brent Civic Centre on 16th December from 11am to 3pm to find out about they help they offer. Penderels Trust will be at the civic centre to discuss about any issues or concerns you may have about using Direct Payments and allow you to meet members of the team who support people in the borough. The team will be in the ground floor entrance area from 11am to 3pm of the civic centre, for more information email brent@penderelstrust.org.uk or call 020 8733 8224. The Melting Pot at the Brent Civic Centre is already offering a free piece of fruit with lunch on Tuesday as part of Sugar Free Tuesday. Starbucks has also cut 50p off all sugar free drinks on Tuesdays too. We attracted a bit of interest from Starbucks after the store manager made this move and it seems that the wider franchise are also taking notice. We’ve been told that Starbucks stores in Watford and Luton in the South East region will also be following suit and knocking off 50p on sugar free drinks following the success of the campaign already in Brent! After the attacks in Paris last weekend, Brent, London and the rest of the world turned their eyes towards Wembley Stadium on Tuesday night. The England v France friendly match was arguably the most friendly match anyone watching had ever experienced, as the Wembley Crowd showed their solidarity with our French neighbours, and the stadium and the Brent Civic Centre was lit up in blue, white and red, and with the French motto of Liberte, Egalite, Fraternite. In 2013, Brent Council is due to move from 14 buildings located all over the Borough to a newly built energy efficient Civic Centre as part of a project which will deliver year on year revenue savings to the Council budget. The Council does not own most of these 14 buildings and for most, these leases are due to expire in the next year or so. Given this circumstance, it actually became cheaper and more efficient to have the Council located in one efficient and bigger building than renew leases for multiple buildings. 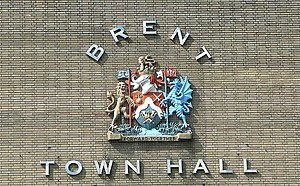 As part of the moving process, Brent Town Hall has been sold to the French Education Property Trust who will set up an Independent French School at the site. The new Civic Centre is due to open this summer.